Stinging insects can be painful and downright deadly! Contact our professionals for assistance. 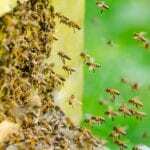 We have been in the apiary business for over 50 years, so we have all the experience and tools that we need to ensure that your stinging insects are removed completely and precautions are taken to ensure that more swarms don’t move in. We know common hiding places and have several methods in our toolbelt to get your stinging insects out of your property with minimal disruption. Additionally, we use this experience to ensure that when we remove your stinging insects from wherever they are nesting on your property, we use the proper gear and will help you keep others around you safe during the process. Here at Florida Bee Removal we want to help you with any stinging insect issue that you might encounter. In the walls or the trees, we are able to safely remove your stinging insect infestation. Please, don’t try and take care of these issues yourself. Not only could you end up in a quite painful situation, but the situations can actually become life-threatening! Give our professionals a call instead for help with stinging insects in your St. Petersburg home or business.